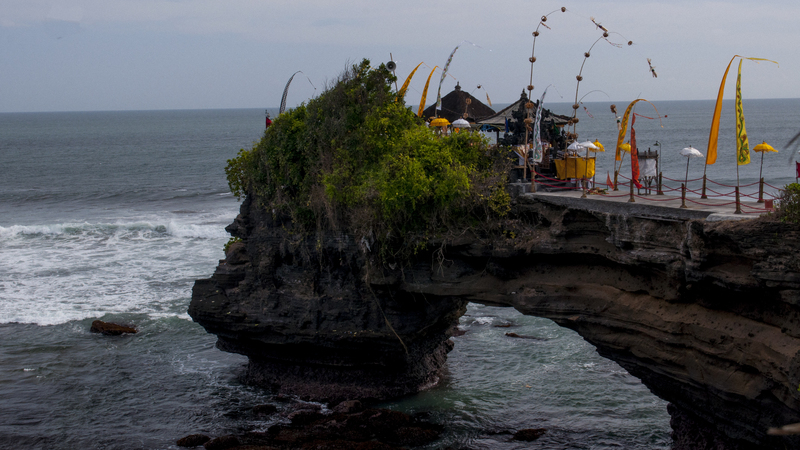 The temple of Tanah Lot sits on a small island located about 50 m off the coast and at low tide is accessible via a soggy, rocky pathway that at other times is hidden beneath the waves. The setting is spectacular and as it sits on the eastern coast of Bali, the sun sets behind it making it even busier in the hour before and after the sun sets. The temple is about a one hour drive from Kuta (less from Seminyak and only about 25 minutes from Echo Beach – of Martha and the Muffins’ 1979 hit song) although a trip in the early morning or late afternoon will inevitably extend this as traffic snarls in the daily rush hour in Denpasar. 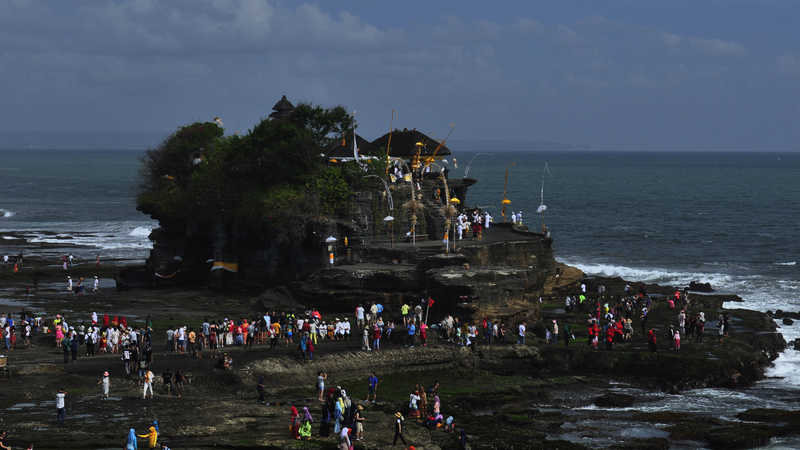 There is a fee per car at the Tanah Lot parking lot and then a per person entry fee (of Rp20,000 per adult and half that per child) to access the site of the temple. Having made your way through the gates there’s about a kilometre of stores selling the usual Bali knick-knacks that you will need to negotiate before you reach the coast and the temple reveals itself to you. 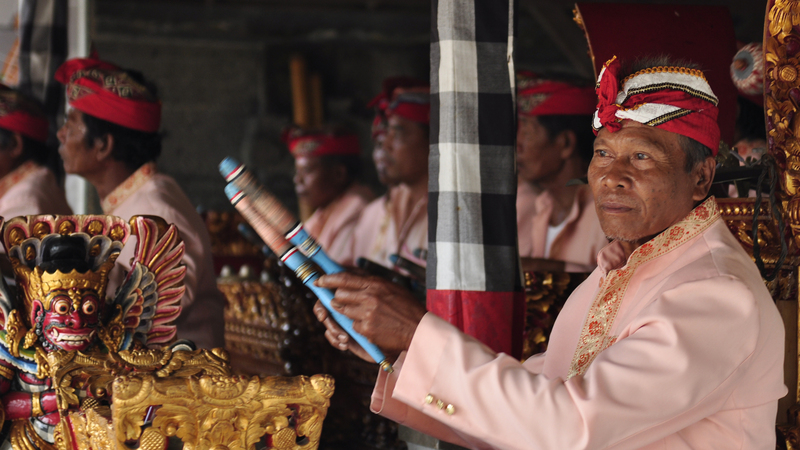 On the day we were there the temple was extremely busy being the Balinese festival of Kuningan,with Balinese worshipers delivering offerings to the spirits of their ancestors. Although this meant that the complex was extremely busy there was an air of celebration to it as white clad figures made an endless procession up the steps of the temple island to deliver their baskets offerings. 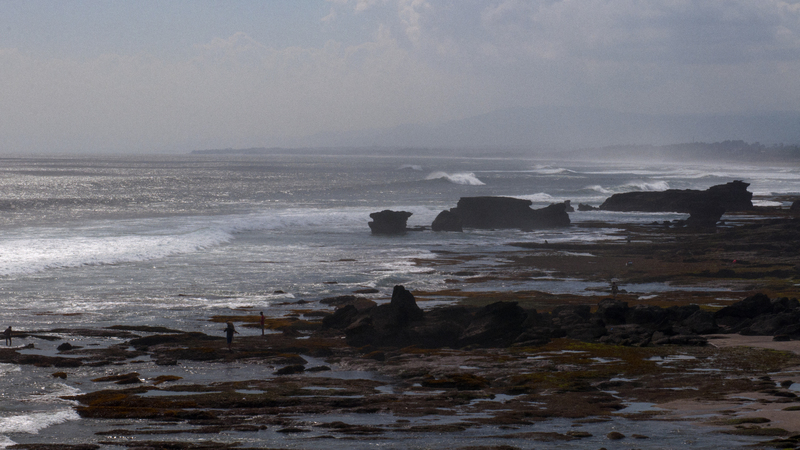 Take the time to walk along the cliff tops to the north of the temple as the coastline in this part of Bali is spectacular with rolling waves crashing against the cliffs and swirling mists giving a real sense of mystery to the landscape. My recommendation would be to ensure that you visit his spot but be prepared for the crowds, especially if you come for the sunset.